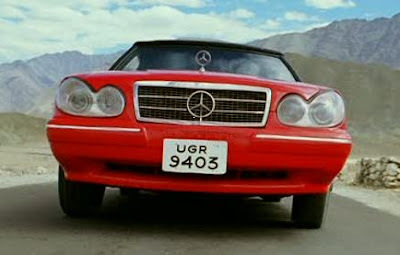 I just started Tashan, and you know how it begins all fantastically James Bond ishtyle, with the stylized credit sequence with a good song and running silhouettes of the actors and lots of bullets, and then it launches immediately into a dialogue-less car chase, and then the car goes hurtling over a cliff? Somewhere in between swerving all over the highway and flying into the air, the damn thing gets a new license plate. I'll be more than happy to munch on my words if this gets explained elsewhere, but it sorta stinks of sloppy at the moment. Tashan and Drona are very close contenders of the worst movie of 2008. I was completely shocked by the amount of money YRF spent on this load of crap. The worst part of it is that it's blatantly obvious; the license plate is in the middle of the frappin' screen. I've never noticed that before! I actually, um, kind of like Tashan? I interpreted it as being a screwball comedy with lots of over-long action sequences. Or maybe I am somehow blind to its flaws. Or just the kind of idiot this film is aimed at? One of my favorite parts of Tashan is the fake version of "Highway to Hell" playing in the car. Lots of reviewers refer to it as the AC/DC song, when really there's no connection except for the title phrase. I loved this film! Yeah it is not a good film but it has a certain energy that appealed to me. Keep in mind that I don't like Saif, Kareena and Anil but still was entertained by the whole thing. The only problem I had with the film that its humour was the mean sort. This usually is a huge turn off as far as I'm concerned but somehow didn't bother me in Tashan. Maybe because no one was spared from it. Equal opportunity mean humour all around. And I love Akshay and he was so good in this. 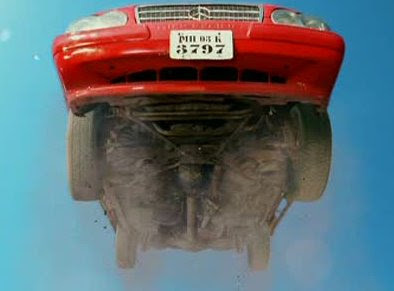 The action scenes were hillarious (I want to say intentionally but am not sure about it) and Akshay was dishooming in synch with the film's tone. It is puzzling how this film was a box office failure since this is one of the few times where everyone but the action director did a good job. and the time it jumps, was shot in Bombay ! Cause they need the car to be thrown in water. Also the scene follows, actors coming outta water-is Filmcity's water tank! There, so busy with SFX, they forgot the plate, and whoaa! U marked such precise thing! Dude, I have never noticed that and I have seen Tashan at least 7 times - 2 of them in the theatre. Everyone - This is actually the only bad thing I have to say about Tashan so far - I really do love its style, Saif's opening narrative, the weird little jumps in and out of reality. So I'm still feeling pretty positive about it and v much looking forward to the rest of it. bollyviewer - Magic! I spent 10 minutes trying to figure out what UGR is, and all I learned is that many decades ago Indian plates had 3 letters. rossywar - Hey, see, that description sounds really good! I remain hopeful. Temple - I was delighted by the bits of the costumes I've seen in previews and all. Can I make it "What the Fishtyle?!?" to save my vocal cords? veracious and Filmi Girl - I hope to join you and rossywar and eliza soon! From what I remember reading when it came out, there's enough in it that sounds good to keep me feeling positive. I was just really struck by that one sloppy mistake, I guess because the credits were so snappy and fun. eliza - Oh my! I love Saif and Kareena and like, but have seen less of, Anil and Akshay. Interesting point on the mean humor - I don't always notice that kind of thing, but it's usually a turn-off when I do. veracious: and meeee! Meeeee! Beth, I love Tashan; I started out sorta liking it and now I lurve it. I've probably watched "Dil Dance Maare" a bazillion times. And I think it has really interesting things to say about language and social status and... oh, I already wrote that post, here. I liked it too overall; and like it more every time I watch it. Add me to the teeny fan club!